The research is centered around (organic) synthesis and supramolecular chemistry. We are interested in developing and using dynamic combinatorial chemistry to discover new and unorthodox receptors for small molecules and (bio)macromolecules. The concept is illustrated in the scheme below with LEGO building blocks. The building blocks are connected via reversible chemical bonds and the constitution of the dynamic combinatorial library can be manipulated by binding of a template. This can be used to perform a very elegant three step procedure - synthesis, selection and amplification of a receptor for the template - all in one step. We are looking for new chemical reactions that make dynamic combinatorial chemistry possible in aqueous media with the aim of templating biologically relevant compounds. A typical project in this field involves a large amount of chemical synthesis and analysis of the discovered complexes. The design and synthesis of new types of receptors for supramolecular chemistry, with a focus on molecular recognition in aqueous media, is being pursued. We are currently looking at receptors that resemble calixarenes and cucurbiturils. Both the development of new types of reactions, optimised protocols for known substrates and new uses of know reagents are of interest. Often the new reactions and methodologies stems from our other research. At present we are particularly interested in rearrangement reactions involving selenium for the preperation of aryl-selenols and in protecion group chemistry of selenocysteine. These types of chemisties are important for dynamic combinatorial chemistry and for advances in bioorganic chemistry. In this project we explore the reactivity of benzoquinones and hydroquinones for the preperation of large heterocyclic compounds: tetraoxacirculenes. These compounds are interesting for studies of aromaticity (and antiaromaticity) as well as for their properties in materials chemistry (light emmitting devices, liquid crystals and more). We are also exploring synthetic strategies for nitrogen containing(and other heteroatoms) analogs of the heterocyclic circulenes. This is exemplified by our recent synthesis of azatrioxacirculenes. We are aiming to use the heterocyclic circulenes as scaffolds in supramolecular chemistry, to explore them as ligands for biomacromolecules and to study the aromaticity/antiaromaticity of the planar cyclooctatetrenes by suitable substitution. We are also working to extend the synthetic methodology to enable us to prepare heterocyclic helicenes. In this project we design and synthesise new types of organic near infrared (NIR) absorbers, that ideally are completely colourless. This is an attractive feature for a number of applications, one being in laser welding of plastic materials. If the NIR dye is incorporated into a transparent the NIR dye can be used to absorb th elight from a NIR laser. We collaborate with industrial partners (Coloplast A/S, Novo-Nordisk A/S, The Danish Technological Institute, FORCE technology and Sun Chemical A/S) on this project. 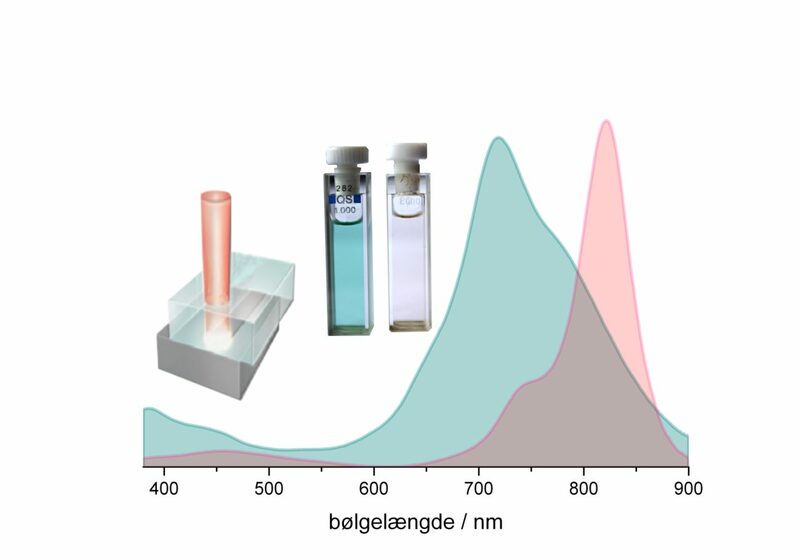 Below the UV/Vis/NIR spectra of a commercial absorber (blue) for laser welding of polyethylene is shown together with one of our new absorbers (colourless).